Bushwalk Australia • View topic - What has been your most adventurous Hike/walk? What has been your most adventurous Hike/walk? What has been the most adventurous walk or hike, that you have done anywhere in the world. I posted on another topic and I decided to dig out some of my old diaries. This one is from 1983. Arrived on 5th May 1983 in Antalya Turkey from Cyprus. Spent 3 days in the town talking to people about routes and options for getting from there to Gallipoli, including some of the local farmers at the markets. There were 3 main roads and a number of smaller roads that I could have taken. On the 9th May the owner of the hotel dropped me on a dirt road that ran north out of the town and the only thing I knew was that there were some village people from that area came to the markets and had told me to stay with them if I came that way, it was little traveled and I didn't know where it went. On 25th Oct about 4 1/2 months later, after travel by foot (a lot of that), donkey, cart and some cars/trucks, I reach Gallipoli. 1700 odd kms of some of the most beautiful country and some of the friendliest people I have ever meet. Would have loved to have had a GPS back then just so I knew where I went, as the maps did not show a lot of detail for central Turkey. Re: What has been your most adventurous Hike/walk? Icefest - The worst thing is I doubt I could repeat it because a lot of the time I didn't know where I was. As long as I was generally heading north, towards Istanbul, I was happy. Tried to retrace it on Google Earth once but a lot has changed in 30 years. post holing through snow and climbing in and out of gorges, in the tararua's NZ off track, average speed 1km/h eleven hours a day three and a half days. got sick, had to skip some meals. others ate my share. no food for the last 24 hours. got to the road end and our transport had shot through. never again. For me would be returning from K3 base Camp over the Gondogora La to Hushe. Was an epic couple of days. The night that we crossed the pass one of our clients fell straight into a river cutting through the glacier. I was terrified we would lose him to hypothermia but he was an incredibly hardy soul and walked it off. So lucky there was no wind. Once over the pass, a porter dropped a duffle bag over a cliff and then ran away. I then had to do a very delicate traverse over the edge to retrieve the bag. We got lost in a the maze of a dry glacier trying to find the route and then after 18 hours of walking our LO suddenly got very tired and I had to assist him down to the village. Late last year crossing over from the Hidden Valley in the Sandache Himal via Dhampus pass down to Marpha was fairly epic as well. Gee some of you guys get around. I'm just envious. By the way. Does anybody know why my posts are in black? For 10 of 12 days we were off track in the most seriously scrubby terrain, somedays we only travelled 2-3 km. Each day we collapsed exhausted. From 42+ degree stifling heat to snow. It had it all. Would I do it again? In a heartbeat. In 2005, spent 7 days with guide trekking the Himalayas in Bhutan between 2,700m and 4,200m. Didn't want to come home. In 2006, 6 days trekking in Nepal. Our guide was worth his weight in gold after he bargained with the maoists to let us through. Some ten or so years ago I was on my way back to Cynthia Bay from the Mt Rufus loop. At the far corner of Shadow Lake I passed a bus tour group of older (60+) Japanese people, mostly couples. None was dressed for the place or the conditions - some of the men were wearing business suits, the rest in perfectly ironed, classy golfing outfits (which, presumably, was about as close as their wardrobes came to 'casual' or 'outdoor' clothing), the women in the female equivalent, almost half even wearing skirts. Footwear ranged from two pair of pristine white leather boating shoes through golf shoes to standard city patent leather, ballet flats, cuban heeled slingbacks, the works. Most of the women were carrying handbags. One got the impression that none of them had ever before done anything even remotely as daring as this - there they were, out in the bush, in the Tasmanian 'Wilderness', on an uneven rocky track, miles from civilisation . . . and they were rapt. To a man/woman their eyes were shining and most had grins so wide the corners of their mouths almost met at the back of their heads. For them, it was one hell of an adventure. I remember them every time I have even the slightest tendency to get blase about bushwalking. It was probably further out of their comfort zone than anything I've ever done. I want to do it again, when you free mate? Why not right now. The weather's fantastic. This walk - South West Cape. Done it twice now. 15 days each time. 2nd time was a bit more full-on as we had over 12KG of camera gear, my pack started at above 33KG - this along with the duration made it the most adventurous. Just me and my wife. To a man/woman their eyes were shining and most had grins so wide the corners of their mouths almost met at the back of their heads. For them, it was one hell of an adventure. Agreed. Going to the Budawangs, Mt Bogong or SW Tassie for tenth time may not compare to the experience of those who venture even to mildly wild places for the first time. The leader took the wrong route, totally wrong spur, with scrub instead of an open hill. All day to do a few kilometre, dry camp on lumps. Attempting to navigate in a winter whiteout near Jagungal, challenging. In Nepal, being abandoned by the trek leader and porters, collapsing on a high col as darkness approached, no food, sleeping bags or tents. One person had to be carried down, and I was not much better. Carrying timber into a hut working weekend, quite hard and exhausting on a narrow track. Descending Folly Point in a deluge. The chains had just the top fixed, with a very real risk of slipping off the end, quite scary. The hard parts and those where things go wrong are remembered very clearly. Last edited by neilmny on Wed 14 May, 2014 9:42 am, edited 2 times in total. The past 49 years of life have been a pretty wild adventure and it keeps getting better!! Does walking home very drunk for the pub count. The pub was in footscray. It was a vanilla trek, can't recall where, about ten days. I was one of the youngest, late twenties. One woman, Susan, was quite old, about my age now. She had managed treks for years, and was fine, if a little slow. Susan knew this, the trekking company knew this, and the trek was selected with this in mind. It was my first trek. I had a lot of bushwalking experience, and was in S&R, very fit. The day started normally, and we were to go to high huts, up maybe 1000 metre from the valley. The next day was up to the col some distance away and to the next campsite. We reached the huts at maybe 2 pm, and Susan was with us, slow but quite okay. To my amazement the Nepali leader then continued. What? There was no choice - we followed. I was fine, but Susan was not. She rapidly ran out of energy, and I stayed with her. The deputy leader was with us; his English was poor. At 3-4 pm I conveyed to him that he needed to go for help from the party. It was way too far to go back, we had no gear, night was not far off. He left. The weather was mercifully fine, no wind, but cold. The track had ice on it. I was in shorts, with a parka and some warm gear, minimal food, some water. Susan got slower and slower, and the path was still up, nice gentle gradient. Some distance short of the col we both collapsed, and that is where they fund us a while later. I think they gave us food and drink - my memory's a bit shaky here. Susan was carried up to the col and down. I walked, slowly. When we got to camp, well after dark, I collapsed again, crying. This has happened a few times when I have pushed things through necessity, such as getting help on a rescue, and when that need goes so does the control. I was probably suffering from hypothermia-exhaustion. It was very late, I had walked two days trekking in one day (which I could have normally managed), I had lain in the open air in cold conditions for hours, no meal, I was mentally stressed. Go figure. In Kathmandu I talked to the trekking company manager. He was from overseas, spoke English well, and was very unhappy. Later I found out why the two days had been done as one. The miserable trek leader would have had to hire villagers to carry fuel to the proposed overnight at the huts. To avoid this payment he combined two days, nearly causing serious grief. Suffice that I am of the view that his intellectual capacity is greatly diminished and his parents are not married. If I had not been there it would have been the deputy leader and Susan. Not good. That's a worry in the choice of trekking company. 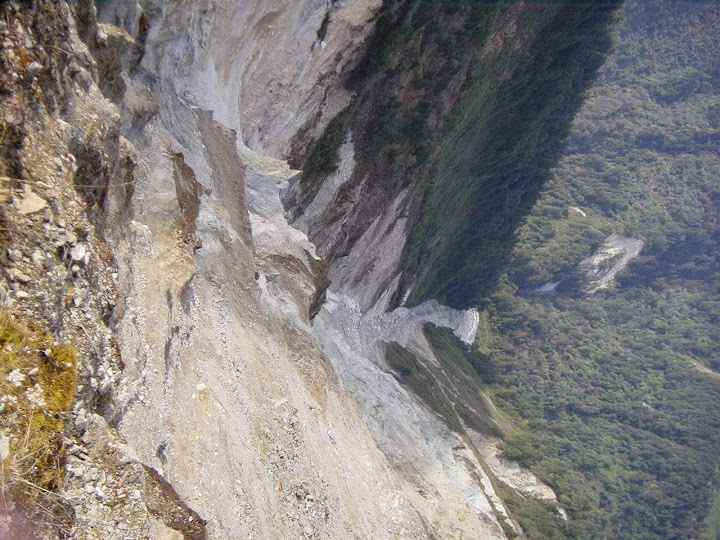 Kangchenjunga - returning from north base camp across the Mirgin La to Suketar airstrip, and confronted with slips like this. It was absolutely terrifying getting across. Last edited by RonK on Mon 19 May, 2014 3:05 pm, edited 1 time in total. Slightly easier to cross if the photo is rotated 90 degrees anti-clockwise.